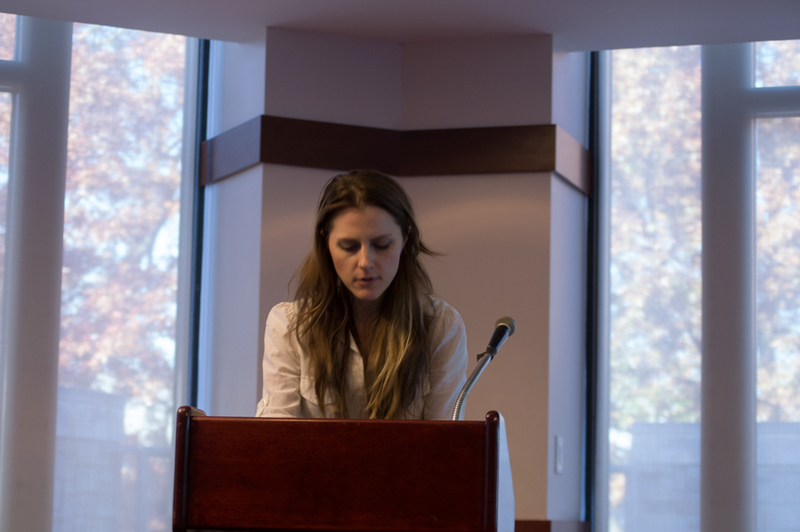 Fordham’s fifth annual Mullarkey Forum took place on Wednesday, November 19, 2014. 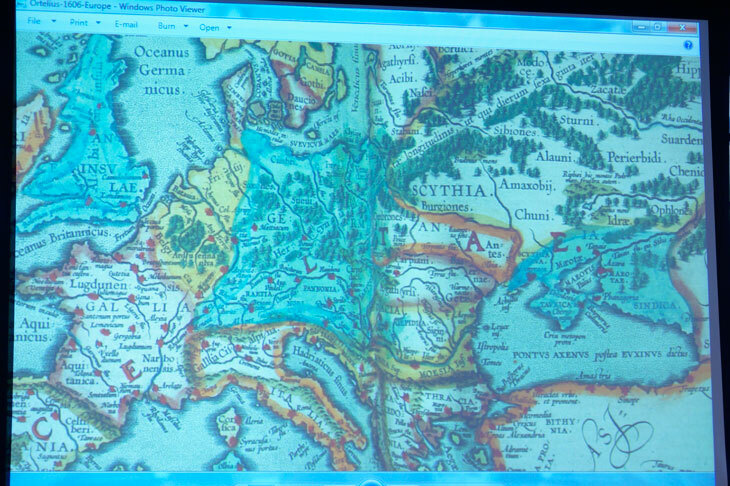 The talks by Fordham English faculty, which were organized around the theme of “Multimedia Texts and Performances,” spanned a wide range of topics and time periods, from plays to lectures to autobiographies, and from the medieval era to the present day. 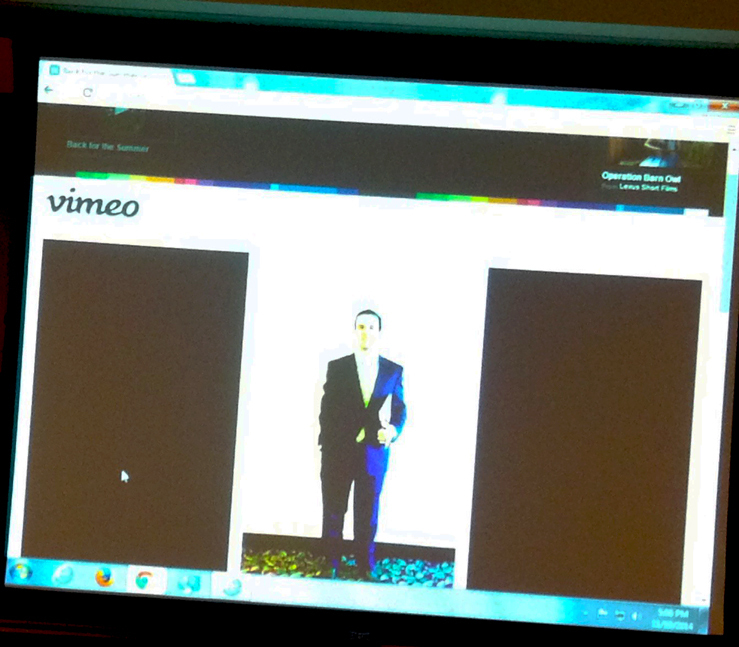 Mullarkey Chair Jocelyn Wogan-Browne on screen from across the pond. The event began with an introduction from English department chair Glenn Hendler. Hendler lauded the forum as an opportunity for the faculty to share their research and ideas with their students and colleagues. He also introduced the Thomas F. X. and Theresa Mullarkey Chair in Literature, Jocelyn Wogan-Browne, who organizes the event each year. Although Wogan-Brown was out of the country and unable to attend this year’s Forum in person, she joined us via Skype, hovering over the proceedings on a small laptop screen like a benevolent ghost. The first of the afternoon’s two panels was chaired by Lenny Cassuto. It began with Stuart Sherman’s talk “Do, Do, Do What You’ve Done, Done, Done Before: Theatrical Repetition and the Live Documentary.” Sherman’s lecture took us to eighteenth-century Drury Lane, where competing playhouses put on elaborate re-imaginings of that year’s disastrous Shakespeare Jubilee. These “live documentaries” enacted a “resurrection of the ‘real’” that had never actually taken place, and provided their audience with new iterations of this event every night. Next Lea Puljcan Juric, who joins us from Croatia by way of NYU, presented her work on “An Illyrian Twelfth Night.” Juric used extensive archival research to answer the question, “What does it mean to produce a real Illyrian play of Twelfth Night?” By reading descriptions of Illyria—the actual place in the northwest Balkans—that were written by contemporaries of Shakespeare, Juric aimed to add more nuance to contemporary criticism of the play’s setting and to reveal the ways in which present-day Western stereotypes of Eastern Europe may influence our reading of this play. Sarah Zimmerman’s “William Hazlitt’s Lectures against Lectures” addressed the difficulty faced by modern literary critics studying lectures delivered prior to the invention of recording devices. In researching Hazlitt’s lectures, Zimmerman turned to notebooks, letters, autobiographies, reviews, and newspaper articles as well as Hazlitt’s own notes to understand his lectures as a performance and not merely as a text. 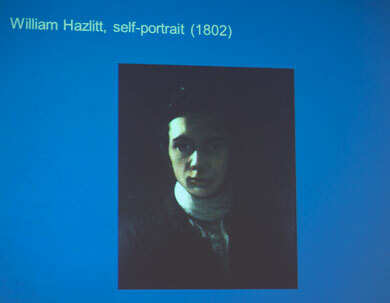 Zimmerman showed us how Hazlitt used the medium of the lecture against itself in order to express his growing disillusionment with the “self-improvement culture” of the early 1800s. The second panel was chaired by John Bugg. The first speaker, Andrew Albin, presented “Communities of canor: Hearing Angelic Song in the Office of Richard Rolle of Hampole.” In his reading of Richard Rolle’s Officium, Albin explored the way in which sound provided Rolle with access to the spiritual world. As a text that attracted readers from the laity as well as from religious orders, Rolle’s Officium occupied a liminal status, straddling the boundaries between heaven and earth, inner and outer, learned and unlearned. 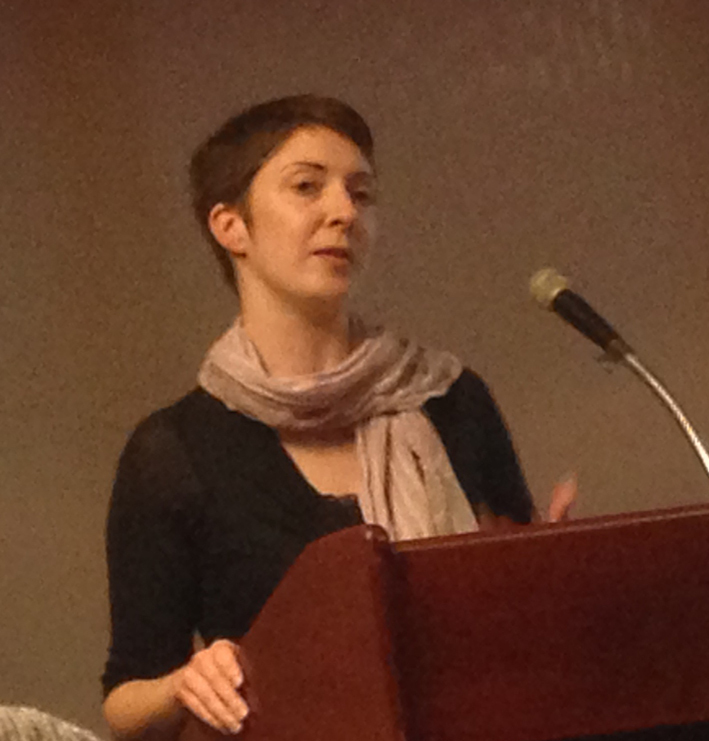 The next lecturer, Trish McTighe, a visiting scholar from the University of Reading, gave a talk entitled “‘That bog’: Beckett’s Landscapes on the Irish Stage.” Beckett’s depiction of the vague landscape in Waiting for Godot resists the easy consumption of the Irish landscape that the 1950s tourism economy encouraged. Such tension is with us even today, as tourist attractions like the Beckett Festival attempt to familiarize an unfamiliar landscape, even as Beckett’s own work acts against this. Elizabeth Stone delivered the final talk of the day, “New Technologies Beget New Genres: Final Cut Pro and ‘Back for the Summer’: A Multimedia Autobiographical Essay.” In this lecture, Stone described her own foray into a new form of autobiographical expression: creative video. Stone explained how working in this new medium helped her to distinguish between her selves as author, narrator, and protagonist. Each panel generated interesting discussion between the audience and the panelists, which then continued over delicious refreshments. The Fifth Mullarkey Forum--made possible once again by the generous support of Thomas F.X. and Teresa Mullarkey--was a great success in bringing together students and faculty, and we look forward to many more such events in the years to come.